A selection of public domain games I have been playing this month. "Birdie woke up one day to find all his pals on the beach had been turned to grey, sad bricks" so begins the stroy behind this game, Birde. The Game was released originally released as shareware and the version I played was the demo version containing a few levels. As the story explained, the idea of the game is to transform the grey bricks back to colour by running over them. A simple idea but one which is fun initially. The task is made harder by enemies which float around the platforms and touching them will result in instant death. Luckily you have 3 lives and if you see a green bird head floating around the level grab it as you will be rewarded with an extra life. The game looks professional. There are some amusing sound effects which accompany the game and the graphics are cute and well presented. The scrolling is smooth and the sprite detection is good. There is also a password system to enable you revisit certain levels without having to play from the start. 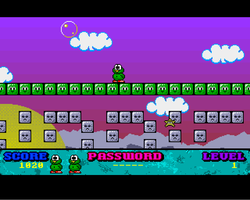 The password is displayed on the bottom of the screen whilst playing the current level. Making a note of this and entering it at the title screen should take you to the desired level. Overall this game has charming presentation and will raise a smile when you first play it. It is rather shallow and perhaps could be viewed as popcorn software. It will engage for a few minutes but will not have enough depth to make you return for repeated play. A time constrant on the levels would add tension as once you realise you have all the time in the world you play the levels with more caution and the tension disappears from the game which is a shame. Breaking News: I am currently working on a CD32 public domain shareware game compliation CD. The majority of games reviewed this month will be available on the disk. Birdie, Bull Run, Balloonacy and Mr Bean Bag Demo levels are all currently included and working on the test CD. Visit the CD32 page to see the full list of games currently included on the disk. Note - Shareware games listed are public domain demo versions unless the author has recently released the full game as public domain. This game is a bit of a mystery to me. I remember it being very highly regarded at the time it was released. I think it may also have appeared on some Amiga Computer magazines as a cover disk. I cannot for the life of me see why this game is addictive. 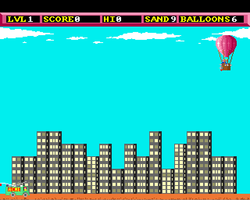 It has a simple idea to move a balloon across a skyline and drop bombs on buildings. The buildings descend to rumble and then when all of them are destroyed you move onto the next level. That's it. The game does have nice graphics and everything is put together with clear skill. I just can't see the addictive angle to make me want to load this up again or to play beyond the first level. During the heyday of the public domain libraries it was not unusal for them to contain demo disks of forthcoming commerical games. Following in this tradition I am going to include a brief description of Mr Bean Bag. This game was originally going to be a commerical release in 2005 but never received a commercial release and probably remains in an unfinished state. The website for the game still exists and there are two levels to download to play. One if the first level for the game the other is a Hallowean Special. The game itself is a cross between Sonic and Mario. There is a map for you to move along a path to select levels which is similar to Mario and the actual levels play similar to Sonic with your Bean Bag character jumping onto the badies and even transforming into a ball to whiz around the screen at faster speeds (see screen shots). The game shows such promise it is a shame if it doesn't at least receive a shareware of public domain release. To download the game and to leave encouraging comments for the author to finish the game for commercial release or a public domain release in its currents form please visit the Mr Bean Bag website. It would be great to have a new Amiga 1200 game to play especially one which could rival Sonic and Mario. The first two months of reviews have seen a platform game and a shoot em up be chosen as the game of the month. For this month I thought I would look at the less popular genre of strategy games and was pleasantly surprised by Bull Run a wargame based on the American civil war where the aim of the game is to capture the enemy's town. Argh!!! Wargames you may cry with thoughts of poor graphics, dull game play and endless confusing commands to master. Whilst these are common faults in some strategy games released on computers during the 1980's and 1990s Bullrun thankfully breaks the trend. The graphics, whilst simple are clear and functional and it is easy to see which units are under your control and where they can move to. The controls are nice and simple and are actioned by using a mouse pointer and a simple drop down menu system. It is possible to achieve some form of success without having to read the rules which is good for those players seeking a pick up and play strategy game. There are some options to add variation such as when reinforcements will arrive, allowing players to maintain historical accuracy if that is their main requirements from wargames whilst also allowing casual gamers to have a more simple a quick game. The game also keeps everything to one screen and therefore appears similar to small table top wargames. This ensures that you don't become confussed with the sheer scale of the battle or forget to give a unit orders as it is easy to view all the units under your command. The one screen map display also ensures that the game does not last hours and enables you complete numerous games within a sitting. The only drawback to the game is perhaps also its greatest charm. The fact it is a simple, easy to engage with wargame does mean that perhaps it has limited long term value as there are no additional battles or campaigns to fight. However this only a minor criticism as its simple interface and clear design will attract new gamers to this genre. It is a shame that more wargames did not pay more attention to creating such clear and charming grahics rather than using unispiring letters or endless text to represent the battle action. Take a risk and play it - it may lead to you enjoying a whole new genre of games you have previously ignored.